Birds of this family are distributed almost worldwide, being found near almost any area of standing or slow-flowing fresh or brackish water. Ibises are also found in drier areas, including landfills. Members of the family have long, broad wings with 11 primary feathers and about 20 secondaries. They are strong fliers and, rather surprisingly, given their size and weight, very capable soarers. The body tends to be elongated, the neck more so, with rather long legs. The bill is also long, decurved in the case of the ibises, straight and distinctively flattened in the spoonbills. More information can be found on Wikipedia. This is a Palearctic species, breeding from the United Kingdom and Spain in the west through to Japan, and also in North Africa. In Europe, only The Netherlands, Spain, Austria, Hungary and Greece have sizeable populations. Most birds migrate to the tropics in winter, with European breeders mainly going to Africa, but a few remaining in mild winter areas of western Europe south to the United Kingdom. It became extinct from the United Kingdom but sporadic breeding attempts in the early 21st Century culminated with the formation of a colony at Holkham in Norfolk in 2010. In 2011, 8 breeding pairs nested, successfully fledging 14 young. 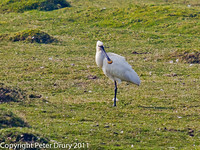 Click on the image to access the Eurasian Spoonbill Gallery. 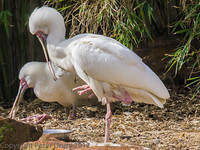 The African Spoonbill (Platalea alba) is a long-legged wading bird of the ibis and spoonbill family Threskiornithidae. The species is widespread across Africa and Madagascar, including Botswana, Kenya, Mozambique, Namibia, South Africa, and Zimbabwe. It lives in marshy wetlands with some open shallow water and nests in colonies in trees or reedbeds. They usually don't share colonies with storks or herons. The African Spoonbill feeds in shallow water, and fishes for various fish, molluscs, amphibians, crustaceans, insects and larvae. The animal uses its open bill to catch foods by swinging it from side-to-side in the water, which catches foods in its mouth. Long legs and thin, pointed toes enable it to walk easily through varying depths of water. Click on the image to access the African Spoonbill Gallery. A wading bird of the ibis family, Threskiornithidae, the Sacred Ibis breeds in sub-Saharan Africa, southeastern Iraq, and formerly in Egypt, where it was venerated and often mummified as a symbol of the god Thoth. The African Sacred Ibis occurs in marshy wetlands and mud flats, both inland and on the coast. It will also visit cultivation and rubbish dumps. It feeds on various fish, frogs, small mammals, reptiles and smaller birds as well as insects. It may also probe into the soil with its long bill for invertebrates such as earthworms. 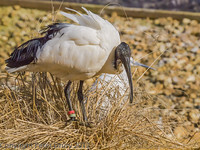 Click on the image to access the African Sacred Ibis Gallery.